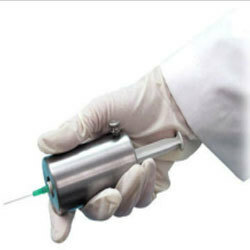 The Tungsten Z-PET Syringe Shield is especially constructed in a way that provides a greater amount of reduction to hand exposure from Syringe. This type of Z-PET shield is manufactured by optimum range of raw materials by using latest technologies. Our customers can avail this Tungsten Z-PET Syringe Shield in the specification of dimensions 2.75" l x 1.7" dia (7 x 4.3 cm) along with the Shielding of thickness 55" thick (14 mm) tungsten. As it has a compact designed the weight of the offered product is 3.7 lb (1.7 kg).